Casio 11.1 MP Exilim High Speed EX-TR50 EX-TR500 Self-portrait Beauty/selfie Digital Camera (International Model No Warranty) is a very good product and would be a great addition to your photographic tools and accessories collection. Whether you are a professional or amateur photographer or someone just having fun with photography. PhotoStuffOnline is happy that you are shopping on our site. PhotoStuffOnline selects products including Casio 11.1 MP Exilim High Speed EX-TR50 EX-TR500 Self-portrait Beauty/selfie Digital Camera (International Model No Warranty) based on CASIO's reputation for producing dependable products. 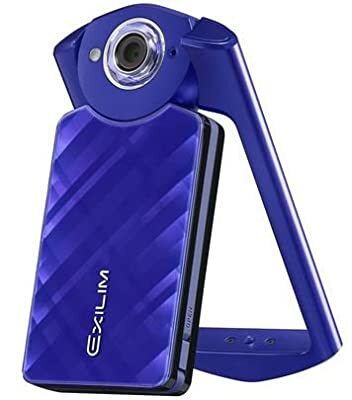 Expert photographers as well as amateurs and beginners alike will be satisfied with Casio 11.1 MP Exilim High Speed EX-TR50 EX-TR500 Self-portrait Beauty/selfie Digital Camera (International Model No Warranty). Take the next step in your journey and buy Casio 11.1 MP Exilim High Speed EX-TR50 EX-TR500 Self-portrait Beauty/selfie Digital Camera (International Model No Warranty) now at this reduced price and save. Our prices are attractive and are among the lowest on the internet. The Casio Exilim EX-TR50 is the follow-up to the unique camera, which had a hinged body that allowed the camera unit to swivel inside a frame. This allows for interesting ways of composing photos, whether setting the camera on a table or hanging it from a door knob. The TR50 features a 1/1.7" BSI-CMOS sensor (up from 1/2.3" on the original model) and an F2.8, 21mm equivalent lens. Beauty is a big part of the TR50: it has several 'make-up modes', as well as promotion movies and posing shot features. It can also serve as a mirror. Other features include a 3" 921k touchscreen display, 1080p video, and built-in Wi-Fi.